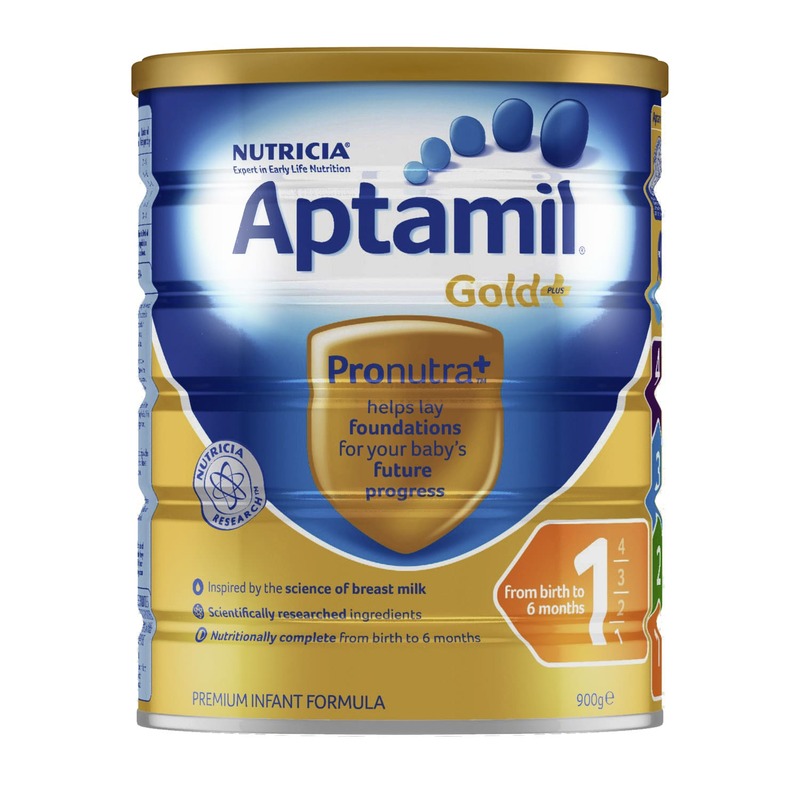 Aptamil® Gold+ 1 Infant Formula is a nutritionally complete premium infant formula designed for babies from birth to 6 months of age. If correctly stored & made up in accordance with the directions contained on the label, no further vitamin or mineral preparations are necessary. Aptamil Gold+ Infant Formula is based on whey dominant cow's milk proteins. Breast milk is best for babies. Before you decide to use this product, consult your doctor or health worker for advice. Do not use if foil security seal is damaged or missing. Dental Hygiene: Putting your baby to bed with a bottle can cause tooth decay. Encourage your baby to drink from a cup from 6-8 months. Milk solids, vegetable oils (contains soy, antioxidant (ascorbyl palmitate, citric acid)), galacto-oligosaccharides (contains milk), dried omega LCPUFAs (contain fish, milk, soy, antioxidant (mixed tocopherols, dl-alpha tocopherol, ascorbyl palmitate, sodium ascorbate, citric acid)), long chain polyfructose, emulsifier (soy lecithin), taurine, choline chloride, L-carnitine, inositol. Mineral: Potassium, calcium, chloride, phosphorus, sodium, magnesium, iron, zinc, copper, iodine, manganese, selenium.Vitamin: Vitamins (A, B1, B2, B3, B5, B6, B12, C, D3, E, K1), folic acid, biotin.Nucleotides: Cytidine-5'-monophosphate, uridine-5'-monophosphate, adenosine -5'-monophosphate, inosine -5'-monophosphate, guanosine-5'-monophosphate. 1. Wash hands before preparing the feed. Clean and then sterilise all the utensils by submerging bottles and teats in water and boiling for 5 minutes, or using an approved steriliser2. Boil safe drinking water and allow to cool. Measure the required volume of water into a sterilised feeding bottle.3. Use only the enclosed scoop. Fill the scoop lightly and level off using the built-in leveller. Avoid compacting powder.4. Always add one level scoop of powder for each 50mL of water. Stir or shake briskly to dissolve the powder.5. Test temperature on wrist before feeding. Feed immediately (do not store). Discard unfinished feeds.Prepare each bottle separately. For all brands of formula, it is safer to use immediately after they are prepared. Product is packed by weight, not volume. Some settling of the powder may occur during transport and distribution. Aptamil Gold+ 1 Infant Formula 0-6 Months 900g is rated 4.9 out of 5 by 17. Rated 5 out of 5 by Saleem10 from Good product The best baby milk available in Australia. Rated 5 out of 5 by ganggang from Great I am so happy to bought this for my children.